When it comes to real estate, the old adage “location is everything,” is certainly the most important thing. When it comes to choosing an aquarium tank, size is much more important. In the past, a common rule of thumb was to correlate the amount of water you needed in your tank to the size and number of fish that were going to live there. Traditionalists stated that you would need a gallon of water per inch of fish, if you were only counting adult fish, but not counting the length of their tail. This rule has been used for years, but at the end of the day, it does not adequately provide for the well-being of the fish for a couple of reasons. First, the length of the fish alone is not indicative of what type of ecological concerns the fish will impart upon its surroundings. Just like people, some fish are slender while others are pudgy. This also does not take into account how the fish will grow and further affect their surroundings. During their maturation, fish may not experience any increase in length, or their weight may increase at a faster rate than their length. If the length of the fish is the only variable taken into account, then an aquarium can easily and quickly become overcrowded. The other issue with the “gallon per inch” rule of thumb is that surface area is not taken into account. Respiration in fish is performed via removing dissolved oxygen from the water in the tank, then expiring carbon dioxide back into the water in the tank. The ability for the water to carry oxygen and carbon dioxide is vital; therefore, surface area is of the utmost importance and cannot be overlooked. The importance of surface area cannot be overstated since the surface is where oxygen enters the aquarium and where carbon dioxide is released out of the aquarium. The more surface area the aquarium can accommodate, the more oxygen and carbon dioxide can be exchanged allowing for more fish to live there comfortably. 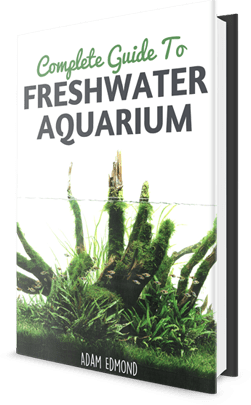 Tropical fish and cold-water fish are also different and these differences must be taken into account when choosing the proper sized aquarium. That being said, to modify the original guideline we can now say a better rule of thumb is to allow between 20 and 25 square inches of surface area per inch of adult fish (still not including the tail in the measurement) for tropical fish and between 25 and 30 square inches of surface area for each inch of cold-water fish, since they typically have high body mass and require more oxygen. While this rule of thumb does not perfectly allow for different body types and varying growth rates, it does provide a higher degree of accommodation for fish. While you can find almost any shape aquarium at your local pet store, you should make your selection based on surface area, which as we have seen is the most important deciding factor. Think of the aquarium as being like a little lake (or ocean) for your fish. A bigger lake can support more fish since it has a greater surface area; a smaller lake could support fewer fish since it has less surface area. Three common aquarium types are regular, long, and show. Show tanks are like the ones you would find on a television show. They are typically tall and narrow, offering a large “window” for passersby to view the fish, but come up short in the surface area discussion. Show tanks, unless specifically designed for large numbers, would usually only be able to support small groups of fish. Long tanks tend to be much shallower than show tanks, but score well in the surface area arena. They offer nice viewing areas just like show tanks, though they require more room for installation. Smaller and faster schools of fish would be well suited for long tanks. Regular tanks comprise many of the units you will find at neighborhood pet stores. You can find classic round fishbowls or hexagonal aquariums, both of which may make you think they would look good on that shelf or end table you have had your eye on, but keep in mind the surface area is much more important to the fish than what shape their aquarium is, what decorations they have, or even how good of a view they have. Choose an aquarium based on what your fish need and you will be providing a safe and happy home to your underwater companions! hi i want to order aquarium.. and deliver at home.. how? thank you. Hi Jenny, the easiest way is to go to your local pet shop. But if you want to order online and get it delivered, you can do so via Amazon. Here’s a link to the best aquarium in Amazon.